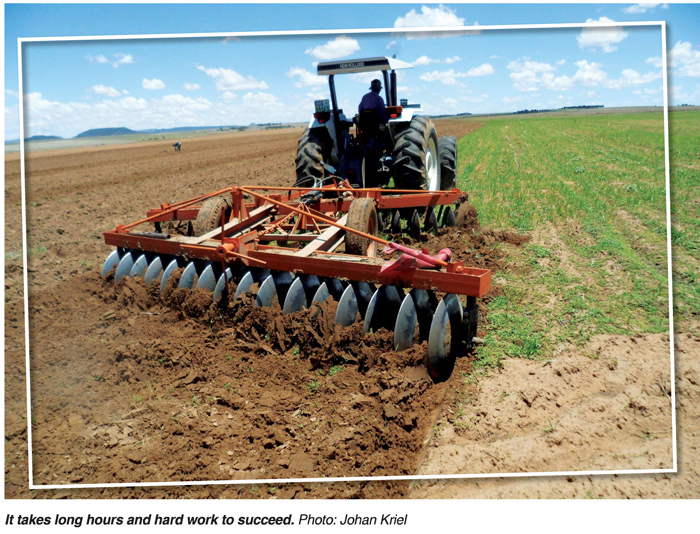 It is possibly true to state that all our farmers, whether large or small or have just commenced farming or have been at it for several years, are dreaming and aiming to be successful and to grow their farming businesses. For this to be achieved your business must be sustainable, in other words, make a profit every year over a long period of time. However, to be sustainable you can never stop changing, adapting, improving and growing. Growing not only in the sense of physical size but it can also be growing in productivity to produce more from the same size. Easy to say, but the difficult part is make it a reality. Bear in mind that this article is presented from the point of view that you must help yourself. Do not depend on for instance, the government to assist you in growing your business. Should our farmers eventually receive more assistance from government that will only be a bonus. In the meantime, help yourself, implicating you yourself must put in an effort to gather information. To grow your business, you basically have two choices – expand or diversify. Expanding is seen as acquiring more land, whether by buying or leasing. However, you can also consider to perhaps open up more land on your existing farm to increase the area under production. Perhaps you could add more infrastructure or equipment. Diversify is to add more enterprises to your farming operations. Such as perhaps including a livestock enterprise, or add a fruit enterprise, which is a long-term investment. To diversify is of course also a tool to manage the risks of your business. Should you expand or diversify or combine the two strategies? Each farmer must consider his/her situation and decide what is best for his/her circumstances. When considering the two strategies or a combination keep the following in mind. Be patient. Remember the expression ‘Rome was not built in a day.’ Success takes time. Plan to take your time but be persistent – keep on doing it. Make your choice. Farm with what you are fond of. Some farmers like to farm with livestock, whilst others may prefer crops. If you are fond of what you are doing you will be prepared to put in extra effort to produce the best products possible. Start small. All our mega farmers or their fathers or even granddads have started small and grew their businesses over time. Make sure you have enough funds, equipment, people, seedlings, fertiliser, feed, or whatever input is needed to produce and market your product/products. Match your expansion plans with available income and resources. Learn as much as you can. Apply yourself to learn as much as possible about your enterprises. Become a professional producer even if you only plant 1 hectare of maize or farm with ten dairy cows. Stay focussed. Focus on your crops or the breed of cattle you are farming with and grow them to the best of your ability. Do not allow yourself to be distracted by stories of high prices for other crops or other breeds. When you stay focussed you will be able to manage the production of your products better and attend to potential problems before they get out of hand. Quality. If you want to make money, you must produce and market the best. Quality always sells, even in times of surpluses. Quality should always be supported by continuous delivery. Buyers will become to trust you because you deliver. Funding. To expand or diversify your business you will need money. Set about this by generating your own funds from the profits you make. If possible stay away from borrowing money, this is another reason to be patient. Focus on your marketing. First, remember before you start producing a particular product, be sure of your marketing arrangements. Other than a few exceptions, all our agricultural products are fresh produce and have a short window for marketing. Once your product is ready to be marketed, you will not have the time to run around to find a market. Be very careful to chop and change your marketing strategy. Be the dependable supplier, supply on time as arranged and supply quality products, properly packed and presented should that be the case. Branding. Decide on a brand name and build your brand among buyers by consistently supplying excellent quality products. You all should know ZZ2 tomatoes as an example. Expanding and/or diversifying is but two strategies that you will have to apply to keep your farming sustainable in the long term. The so-called cost-prize squeeze will force you to apply these two strategies to maintain a sustainable profit. But remember, to apply these two strategies you need information and get as much information as you can. Information is available from many sources, but you must put in an effort to obtain the information. You must help yourself.